Seattle, Los Angelas, LA, Long Beach, Longbeach, Houston, Savannah, Norfolk, Honolulu, New Orleans, New York, Newyork, Boston, Wilmington, Baltimore, Portland, Tampa, San Francisco, Miami, Chicago etcs. London, Felixstowe, Southampton, Glasgow, Belfast, Cork, Newcastle, Dublin, Liverpool etcs. Johannesburg, Cape Town, Durban, Port Elizabeth, East London etcs. There are a large number of product suppliers in China, but no matter which supplier you need, the suppliers should follow your time and requirement for producing. Whether you are a medium-sized business or a start-up business will have a certain impact on different suppliers, in this cases what is most critical to your success is the need to find the right shipping solution for your different number of products, and it should closely follow your marketing requirement. If you want to avoid the risk between Seller and Buyer, you should well know the Incoterms 2010. Top 4 tips guidline for import from China as below. 1. How to Select the Best Shipping Method? 2. 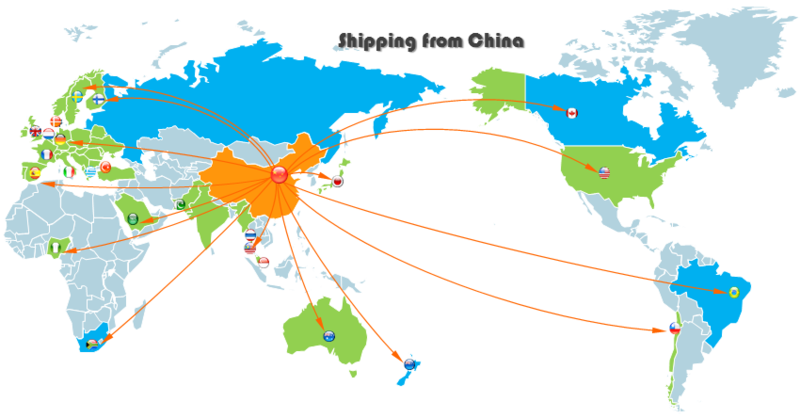 How to Reduce your shipping Cost? Shipping cost and Transit Time vary depending on product, gross weight, volume, location and shipping method. Please find the different way to shipping your product. In general, air freight is the fastest way to ship your goods. Air services is transporters through airline, which can be charter or commercial. Such shipments travel out of the commercial and passenger airways to anywhere planes can fly and land. The shipping options of air freight make it a valuable option for coordinating time sensitive shipments to almost anywhere in the world. This can be particularly advantageous for all the companies as it allows them to participate in international trade in an expeditious and effective manner. Shipping by air also offers the advantage of a high level of security as airport controls over cargo are tightly managed. The China freight agent can determine the most reliable and cost-effective means for using different air freight options or airlines to coordinate corporate, individual parcel or shipment deliveries. The China freight agent can negotiate the vast array of options and determine the most applicable means to ensure expedient and on-time delivery.As only origin freight agent familiar with the prices and schedule of different airlines. As with all international shipping, customs clearance procedures must always be anticipated and properly Shipping documents. Working with an Origin freight agent for your air shipping ensures that all aspects of your freight management are covered, from expedited service through customs clearance and shipment delivery. Because only the origin freight agent familiar with the local Customs, CIQ and Port Authority's requirement. For example, each of the different cities in China, The understanding of the national policy and requirement is different by different officer, the port requirements are not the same, the National general office also will adjust the policy basis on the different area. And only direct contact with the origin freight agent, you will get the progress of the goods and the situation in the first time, so that you can get your timely reflection, otherwise it will be likely to affect your delivery requirements. We suggest if the chargeable weight is over 45kg, you can try to choose air freight. Almost 90% of the products in the world are shipped by sea. Before finalizing the procedures for your sea freight transportation by container, you will have to choose between a Full Container Load or a Less than a Container Load or Buyer Consolidation. Full Container Loading (FCL) will allow you to use a container for your goods only, not shared with others. This is the best option if the volume of the goods allows you to fill a 20 or 40 foot container as each container can carry a total of 33cbm per 20ft container, 67cbm per 40ft container, 76 cbm per 40 feet tall cute container Or 86 cbm per 45ft container, Also can provide different type of container for different kind of products, such as Open Top Container, Referigerated Container, Flat Rack Container, Plateform Container, or Garment on Hanger Container, please find container specification if you need to know each type of container dimension. In this way, you will be able to choose different containers based on your different cargo and volume in order to have more advantage for shipping costs, because FCL shipping begins to be more profitable when you fill more than half of the container; in addition, if you want avoid any damage or contamination when sharing containers with other traders, and you will also benefit from full container loading.Here you can learn more from container loading guideline. In other cases, less than a container loading (LCL) - sharing a container - will allow you to save transportation costs in case your cargo is not large enough to fill the container, and if you are not worried about the risk of sharing the container with others. This option involves sharing the container with other goods belonging to other traders, but you pay only for the space used by your cargo, with great savings on your shipping costs. Buyer Consolidation, In many cases, if your goods can be filled with a container, but because the goods are produced by a number of different suppliers or by different trading terms. Respectively, LCL is not a good choice, the costs and risks will be a corresponding increase. In this case, we recommend use of buyer consolidation services, to select an origin freight agent who can provide storage and transportation services, and can provide a full range of logistics services is particularly important. They will not only arrange your shipment according to your request, but also timely report on the production of various suppliers and delivery. And they also will deliver the product to your nominated place on time by your instruction. Courier service is also known as the "express service", is basically a "door to door" service, courier company will get your goods from A (your supplier in the country of origin) to B (your delivery address in destination Country). This is a convenient and quick option to ship your goods, generally more suitable for smaller or lighter goods. The courier company will manage all the processes required for goods from A to B, including local pick-up and delivery, customs clearance at both ports, tax and duties payments (will be charged to you seperately),etc. The most famous courier companies are Fedex, DHL, TNT & UPS. But why you need to select a China freight agent to handle your products, As the China freight agent can act as your agent to provide the following services instead of the courier companies. To collect your small products from different suppliers to avoid Min charges per bill. To collect your products (Sample), and arrange the courier one by one according to your instruction. To communicate with your suppliers and reporting the cargo status. To settle the small product payment to different suppliers to avoid international bank charges. To adjust the logistics methods according to your needs. To provide short-term, long-term warehousing services. Replace the packaging, lable etcs according to your request. OOG (OUT OF GAUGE) is short for out of gauge container or out of standards containers; OOG containers could be divided into Open Top Container and Flat Rack Container, and Flat Rack Container is shorted as FR. Open Top Container is used to carry heavy and/or bulky finished products, which handling and loading can only be performed with a crane or a rolling bridge. And Flat Rack Container is dedicated for the carriage of heavy, bulky as well as over height and/ or over width items. To those items that are over length, over width, over height and over-weight, break bulk (2 OR MORE FLAT RACKS as bed = BREAK BULK, that is BB CARGO) is the suitable way for delivery. This type of equipment is particularly suitable for goods that are not scale of shipment, but can not load it into the standard containers. This way there is a certain guarantee of delivery time and cargo safety. Break bulk cargo is defined as general cargo that do not fit in or utilize standard shipping containers or cargo bins. Break bulk is also different from bulk shipping, which is used for cargo such as petroleum products or grain. Instead, break bulk cargo is transported individually, oftentimes on a skid or pallet or in a crate. Please click Gencon 94 to view the shipping terms of Break Bulk. Steel products: seamless steel tube, Steel pipe, Casing, steel coli, steel section, steel plate, steel rod, big steel constructions and special steel materials. Mechanical Equipment: concrete mixer, Excavating machinery, Crane, Pile driving machinery, road construction machinery, Port machinery, Petroleum equipment, Coal machinery, Numerical control machine, Compressor, LNG equipment, Engineering vehicle, Production Line etcs. RoRo (Roll-on/roll-off) ships are vessels designed to carry wheeled cargo such as automobiles, trucks, semi-trailer trucks, trailers or railroad cars that are driven or towed on and off the ship on their own wheels. If your product can not be driven, also can use Mafi equipment to load your cargo that can be Roll on or Roll off from the RO RO vessel. This ships “Roll-on” and “Roll-off” its cargo through its built-in ramps. The ramps could be located at the stern or/and on at the bow. Some ships have ramps installed on the port side of the hull. The safest and most inexpensive way to handle and transport oversized or special project cargo. Shipments often move as one piece using specialized trailers from origin to port to destination. Less physical handling and there is no need for costly dismantling and reassembly. There is no exposure to water or the elements because the cargo is always secured in Ro Ro/Containership's garage decks for the entire voyage. Heavy lift ships, with cranes with a combined lift capacity of hundreds of tons, can easily lift super heavy cargoes and carry super long cargoes up to 100 meters on the main deck. The box-shape hold can be adjusted to multiple decks. The ships are regarded as the right carriers for whole set of equipment and project cargoes. Heavy Lift Vessels are specifically designed to carry heavy or oversized cargo. These vessels meet the rising demand for block or modular transportation for fully assembled plants and/or equipment. Most of the heavy lift ships are self-sustaining diversified cargo handlers. They can be equipped with gantry or telescopic auxiliary cranes for the conventional load-on/ load-off ramps for Ro-Ro movements, and have semi-submersible capabilities to accommodate float-on/float-off operations. In some instances operators extend their activities to cover inland transit with multi-wheeled self-propelling transporters enabling carriage of cargo from the point of manufacture to final destination. The term "heavy lift ship" is ambiguous. By one definition, a heavy lift ship is an ocean-going vessel capable of submerging its large open deck to well below the water's surface, thus allowing another vessel to be floated over it and landed on a dry-dock-build mounted on the heavy lift ship's deck. The heavy lift ship then rises out of the water by pumping out its ballast tanks in a process very similar to the operation of a floating dry-dock. The transported vessel then rides on the deck of the heavy lift ship for the voyage to its destination. This type of ship is also known more precisely as a Float-On / Float-Off [ FLO-FLO] Ship. By another definition, a heavy-lift ship is a ship that is specially designed and capable of loading and unloading heavy and bulky items. It typically has booms of sufficient capacity to accommodate a single lift of over 100 tons. This might be better known as a Crane Ship. The Crane Ship mission is to off-load containers and other outsized cargo from non self-sustaining cargo ships offshore, or at bare or underdeveloped ports. 1. Insurance, appointed an origin shipping agent to arrange the insurance, the rate will be much better. Buy insurance from an origin shipping agent. While shipper or carriers charge about 80 cents for every $100 of insurance, the third-party companies like your shipping agent charge about 45 cents. The savings can add up, Mitchell notes, if you frequently ship expensive items. arrow the country, as you know not only courier, but also air freight, sea freight have min charges, if you have 10 supplier, each supplier have 0.2cbm goods, and then collect it all by one shipment to export, that will reduce much shipping cost. Below also is a good way to collect different shipment. LTL (Less than a Truck Load), if the goods between 100kgs to 3000kgs, this is the best way to collecting. National Courier: for small shipment upto 100kgs, the National Courier will be lower than Fedex, DHL, TNT. 3. Arrange the shipment by nearest loading port. So many country have Few Main Sea port or Airport, they also have so many different Feeder Port, China for instant, if the exporter locate in the Mid of China, you can arrange the shipment FOB Feeder Port instead of to arrange the trucking to Shanghai port, as you know, the Feeder charges will be much better than Road transportation. 4. Reduce international bank transfer charges. As you know, the international bank transfer charges is not low, normally between USD20 to USD80, especially for you to purchase small order or sample from different export. In this way, you can check with your origin freight agent whether they can provide the money transfer services for you. We also accept the payment via Paypal, Alipay etcs. For example, If you purchase 5 different products from 5 different supplier, You can transfer all the products money and shipping charges to your agent, and then your shipping agent to help you to transfer the product money to your different supplier, this way can save your bank transfer charges. In other words, if the product money is much higher than shipping cost, suppose it will be very difficult for your shipping agent to bear the extra Tax, so you can transfer the shipping freight to your exporter together with your products money, and then ask your seller to transfer the shipping freight to your shipping agent. 5. Arrange the shipment to an origin freight agent. If you find a destination freight agent, the destination agent also need to find an origin freight agent to handle your shipment, and they also will markup the shipping freight basis on the origin shipping agent. To arrange an origin freight agent, you also can get the first hand shipping information and status to avoid transfer again and again. In China, The exporter or importer must obtain an export or import permit when proceed their goods to and from China. For any medium or large factory or trading company who will obtain the license for their product. If the supplier can not provide any export documents or expert permit, you should be careful to select your freight partner to export your shipment, there are so many hidden risk and benefit when you purchase the export permit, If your freight partner want to get more benefit and purchase the wrong export permit, Your product will be confiscated by China Customs. a) Your product does not belong to the Chinese customs approval of the list of VAT-refund. But your agent declare your product as other description. b) Your product only value USD10,000, but your agent declare the product value USD100,000, want to get more VAT refund from China Customs. So becareful if the factory can not provide expoert permit. And don't belive if it's free to get export permit. As no company can 100% make sure that your cargo will not be losted or damaged during transportation, so suggest that you to purchase insurance to cover the risk even we can make sure 99.9% no problem. Please click here to review the China Port and Location Map. Besides above Main Airport, almost each city have airport,if the origin city is near the main Airport,suggest to pick up your cargo by truck or local courier, But if the origin city is far away from the main Airport,suggest to deliver your cargo to the nearest airport,and then arrange it to the main Airport by the National Commuter airlines. Besides above Main Container Seaport, still have more than hundreds Feeder port in China and can provide Feeder services between the Feeder port and the Main Container Port.